Sierra Delta Power earthing provides clients with earthing upgrades to existing and new electrical installations, both overhead and underground. We provide trenching and excavation works on-site, vertical or angled holes for stay pins in extremely rocky areas. 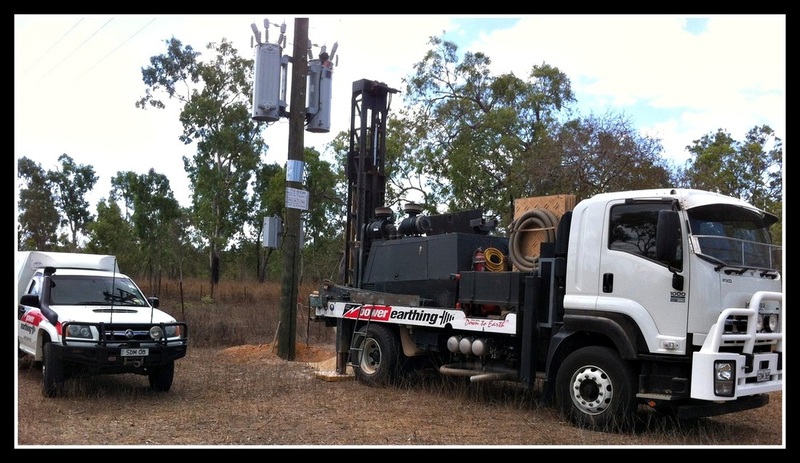 Our crew hold Ergon Energy Generic Contractors and authorised persons certifications, and currently carry out Ergon upgrades and repairs on the Central & North QLD coastal and Inland areas from our base in Proserpine. Our equipment includes a purpose built rig to work safely under overhead installations, a 4.2 tonne mini excavator & 4 wheel drive support vehicle. The rig is mounted on the back of a single axle, single steer medium rigid truck allowing standard vehicle transit times to and from most sites. The rig is built to heavy duty standards & fitted with a 425 cfm compressor and down the hole hammer for rock drilling in extremely hard areas. The mini excavator is utilized for trenching in earth wires, and light excavation works on-site if required. A 4WD utility is included for transport of supplies, locating sites and crew transport to/from accommodation and mini excavator.